The Greater Northern Sage-Grouse is on the path to extinction in Canada with 13 males in Alberta and 18 males in Saskatchewan at the latest lek counts. The “Sage-Grouse Recovery Project” has put together an interdisciplinary group of University of Calgary researchers (from the Faculties/Departments of Veterinary Medicine, Biological Sciences, Environmental Design and Geography who are affiliated with the interdisciplinary Wildlife Ecology Group), Government Agencies (Alberta Sustainable Resource Development & Montana Fish, Wildlife & Parks) and the Energy Sector to try and reverse this dire situation. We are applying conservation strategies at a regional scale to stabilize and increase the sub population of Sage-Grouse in southern Alberta. Over the past two springs (2011-12) a total of 41 birds (38 females) were translocated from active leks from large, stable populations in south central Montana, to the silver sagebrush ecosystems of southern Alberta, areas historically used by this species. The Montana birds were released at the remnant Alberta lek sites which still had displaying males and attending females. 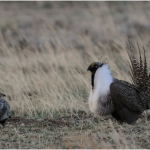 Factors that have contributed to fragmentation of Sage-Grouse habitat include oil and gas development, as well as conversion of sagebrush-dominated rangeland to crops, or improved forage for grazing. 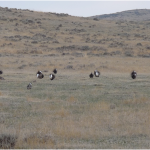 Our research group/recovery team is working with industry to reclaim habitat and connectivity between adjacent Sage-Grouse populations. The success of this program is dependent upon its cohesive, interdisciplinary and collaborative nature, involving government agencies, academia and the energy sectors. Time remaining is short, because with Sage-Grouse, the only successful translocations until now (all in United States), have been into areas with active leks. Previous story A new hookworm in black and grizzly bears in western Canada?